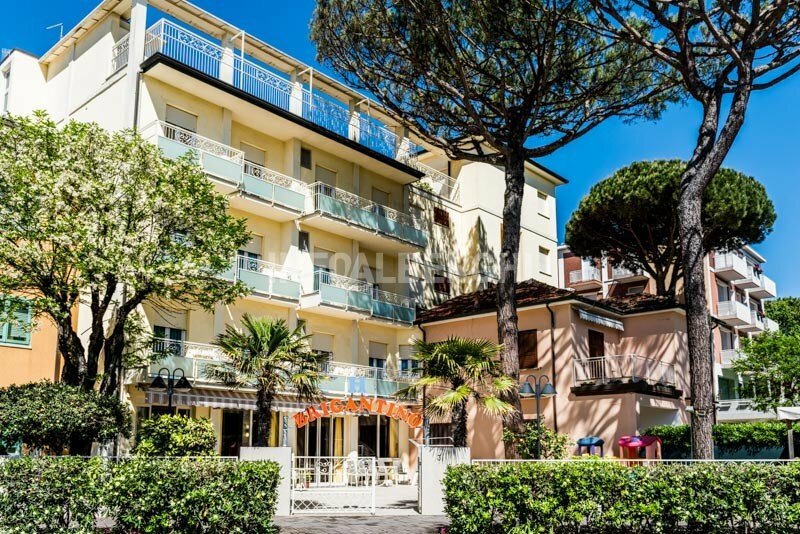 The Hotel Brigantino , a two star hotel in Milano Marittima family run, is located in a quiet green area between the beach and the pine grove. It has games for children, sun terrace, WI-FI and air conditioning. Admits small pets. The hotel is located near the center of Milano Marittima, in the coastal strip between the sea and the centuries-old pine grove. It is a quiet and peaceful area, but at the same time not far from the center which can be reached on foot in 10 minutes. Also close to the thermal baths of Cervia that can be reached by bus in about 15 minutes, or by car in just 5 minutes. The rooms have a balcony, air conditioning, digital terrestrial TV, WI-FI connection and safe. On request: hairdryer. FAMILIES: communicating solutions are available for families and groups. Garden terrace with playground area for children, free use of bicycles, bar, air-conditioned dining room, lift and sun terrace. It also organizes entertainment and entertainment evenings for adults and children. Free airport / train transportation service. PARKING: uncovered, with limited places. AIR CONDITIONING : present in all environments. BREAKFAST: buffet and offers brioches, yogurt, cereals and juices. LUNCH AND DINNER: are proposed the best recipes of local tradition, with meat dishes, fish and homemade pasta. In addition to the classics of Romagna, there are also national and international dishes, a vegetable buffet and a choice of menus. In hotel: outdoor playground area and pediatric counseling (for a fee). At the restaurant: high chairs at the table and baby food for weaning on request. The prices of the price list are per person per day for a min. of 3 nights. TOURIST TAX: Excluded from the price list. € 0.50 (April-May-September), € 0.70 (June-July-August) per person per day for a maximum of 7 consecutive nights, excluding children up to 14 years.